What Is DadSews All About? Well, I’ve always wanted to learn to sew. This year I turn 40, and I’m starting to get embarrassed asking my mother to hem my jeans. This is a skill I should have in my tool belt. Especially now that I have four kids. There are socks to darn, holes to fix, etc. Knowing how to sew is a money saver, and I NEED to save money. When you watch DadSews, you will be seeing me learn to sew before your very eyes. I haven’t sewn a single stitch before I clicked record. Why on earth would I do this? Well, I’m a firm believer in being held accountable so you’ll actually follow through with your goals, but really, I just want you to enjoy my fails. And, wooo boy, will there be fails. In our very first video, I got so angry at our machine that my kids and I did a shot-for-shot remake of the famous Fax Machine scene from ‘Office Space’. I love doing this type of thing (you can check out more of my videos at PlaidDadBlog.com). We plan on having a lot more fun whenever I fail in sewing projects. We’ll also have fun videos like the upcoming, ‘5 things I leaned as a Dad Shopping at a Sewing Shop’. 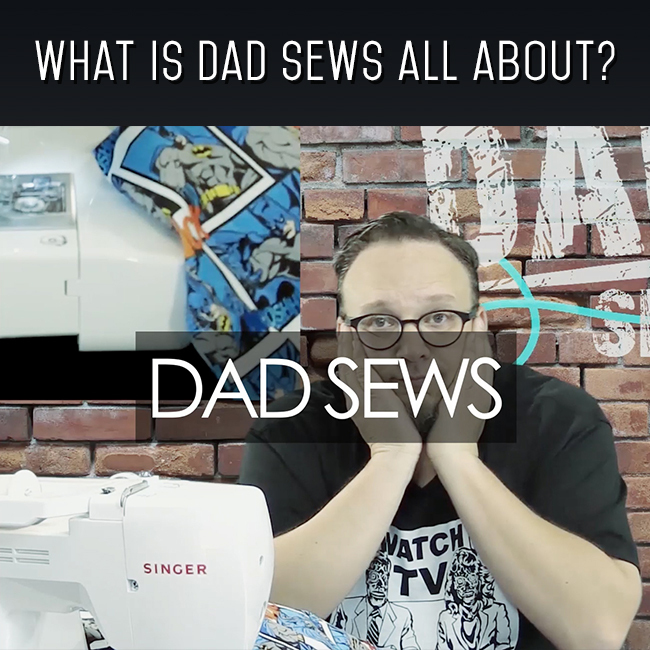 We hope you keep dropping by DadSews and will share with all your friends. Don’ forget: SEW. FAIL. REPEAT. 10 Responses to What Is DadSews All About? I really just want to mail you supplies. Anytime, just drop an email to DadSewsWeb AT gmail. OK, easy way to sew around a square without those annoying chain “tails”? Serge to the end of the 1st side…..lift your presser foot, and make sure your needles are in the “up” position. Now, turn your project, and start serging the 2nd side; do the same thing till you’re up to your 4th side. Leave a couple of inches of chain and take either a double eyed needle or a small crochet hook, and insert through the seam, wrap your chain around the crochet hook and weave it through the serged seam…..easy peasy!! Love watching you and the things you make! You’re a great role model for your kids!! EXCELLENT tips Sylvia! Thank you! Hello Dad. I am a fairly new you tube subscriber & to your facebook page. I just saw the “10 biggest sewing mistakes beginners make.” I’ve already made one: buying too much fabric. I’m not a novice beginner. I learned to sew over 30 years ago in home Ec, stopped have been on & off again since 2008 -that’s why I still consider myself a beginner. I got some fabric last week and a few days ago (a yard) but prior to then, purposely hadn’t gotten any in about a year. How does one rid themselves of this if they’ve already started? Most of the sewing world encourages this saying you should have a lot when you’re ready for the project. If you have some experience sewing, I’d suggest getting a pattern and trying something new. And be willing to waste some of that fabric on a project that doesn’t come out perfect. It does take practice and mistakes to get better. Just wanted to say I love the videos. I really like and appreciate the live element and the honesty! So refreshing. Btw I’m from the UK. Please keep them coming. Could I post a request for a video? I would really like you go through changing sizing on paper patterns? I’ll add that to the list!! Thanks so much for the kind words!